Most of the original stone walling and wooden beams dating back to circa 1787 are retained in this outstanding conversion into a very beautiful home. 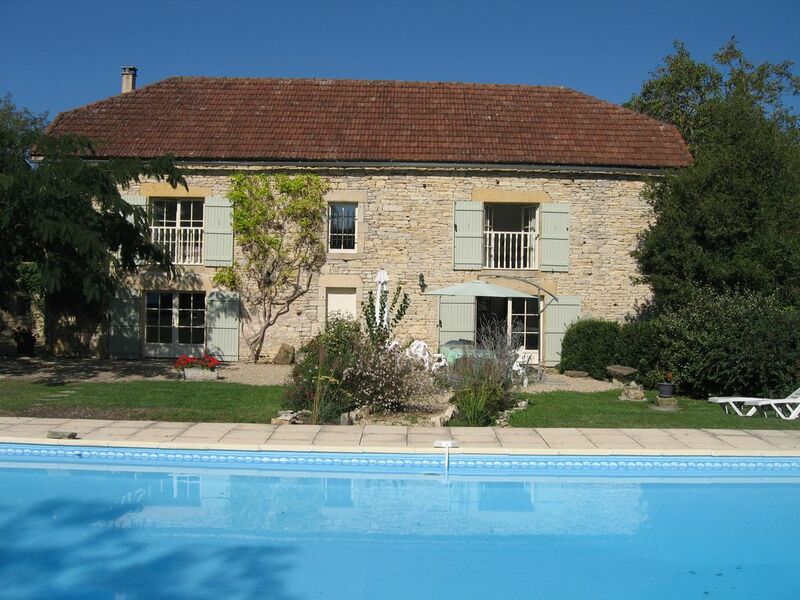 Situated in the peaceful countryside of the Tarn et Garonne the house faces Southeast and enjoys the sun throughout the day, but trees around the garden and pool ensure some shade is always available. The open plan ground floor has a fully fitted kitchen. The dining and sitting areas are comfortably furnished. The hall area is galleried being full height. The front door and two sets of French windows open onto the garden. The creation of unusual light and space ensures that the house remains pleasantly cool in the hot summer months. The medieval town of Caylus is only 10 minutes drive away and here you will find 3 patisseries, a supermarket, newsagent, a bank and the weekly summer market. The two star Logi hotel 'La Renaissance' has an excellent restaurant. Alternatively you may collect your baguette and croissants from the delightful hilltop village of Parisot (3.5 kms) which includes a patisserie, boulangerie, chacuterie, pharmacy and a restaurant. Below Parisot is a picturesque lake for swimming and other water sports. The dramatic Aveyron Gorge is just a 20 minute drive and from the lovely 15C town of St. Antonin Noble Val it is possible to hire canoes on the Aveyron river. Hiding in the surrounding countryside are the many ancient and attractive bastide towns and villages such as Najac, Cordes sur Ciel, Villefranche de Rouergue and Caussade. Most towns have weekly markets. Larger places such as Albi,Cahors, Montauban, Toulouse and Carcassone are all within easy reach. The Atlantic and Mediterranean coasts and the Pyrenees could be accomplished in a day. As a couple we are best described as 'professional', my husband is a surveyor and I cook. We moved to Norfolk from London in 1980s. Our family are Francophiles having holidayed in France throughout the past 30 years. We have always been interest in areas which have remained French and unaffected by tourism, industry or other development. Tarn et Garonne is one of those areas where agriculture rules but it is steeped in history. We had always toyed with the idea of buying a place but the demands of family type holidays involving teenagers meant that we could never settle on one place. Once they left home, married and started families of their own we decided to 'live the dream' and at the same time create a 'granny trap' for the next generation. This decision is something we have never regretted. We love barns. Having bought a renovated several at home in the UK over the years we came across La Grange through a local contact who knew that an English couple who had bought it originally then as an agricultural building and had converted it over many years were thinking of selling and returning to the UK. Seeing as a project to complete we pounced. We have had work done in the closed seasons such as repointing the stonework, installing heating, extending the pool and restoring the ruined farmhouse as an outbuilding/garage. From May to October we have used La grange either by ourselves or with our friends and family and let it out to others who would appreciate it in a like manner. This has worked most successfully for the last 10 years and we hope that this will continue for many years to come. La Grange forms part of a small hamlet having been the original farm building complex. There are 3 cottages and the original farmhouse all situated to the North of La Grange. None overlook the property and apart from the farmhouse none are occupied other than by owners (2 Belgian, 1 English) as holiday homes. The location is most quiet and rural without being isolated. Having been a barn the building has a open plan ground floor which makes its use flexible. This seems to suit families whose members want the space to do separate activities but not on their own. Supervision is possible from any part of the ground floor! The house and garden are located in a rural position surrounded by woods, farmland and on the edge of the Ruisseau Valley with views across to the village of Parisot. No view is spoilt and the feeling of being in the countryside is complete. Apart from the wildlife there is no sound. Whether on foot or by bicycle there are many miles of track and lane to discover from the house. Many circular routes are marked on the maps in the house. Bed linen and tea towels are changed on a weekly basis. Both the bathroom and shower-room have full suites including WCs. There is also a cloakroom with a WC and washbasin on the ground floor. The 10m x 5m metre swimming pool with a 3m x 1.5m stepped roman end is private to the house. It is serviced regularly throughout the season. Comfortable, easy to live with. Lovely part of France, good pool, everything worked. Between the gorges of the Aveyron in the South and of the Lot to the North, spring comes early here, then the pleasantly hot summer and the sunny autumn. On the Causse, the wild extensive limestone plateau, the woodland valleys and rushing rivers provide a timeless change of environment, wonderful for walking, cycling, and horse riding and, of course, canoeing on the rivers that run sparkling and quick in the limestone gorges. The sudden surprise of coming across the hidden jewels of medieval villages and towns deep in the countryside is a delight and adds a real and lasting pleasure to our stay. Here in the deep countryside, time has been slowed down to its proper pace which makes our stay here so relaxing - we do much more, but take more time doing it. Rental includes bed linen, hand & bath towels and tea towels. The bed linen is changed weekly on longer stays.